Amon from Martin Rusev is a simple yet flexible way to add server monitoring, logging, and error tracking to your web stack. Amon consists of three parts: a collector daemon, a Python web app, and JSON API. 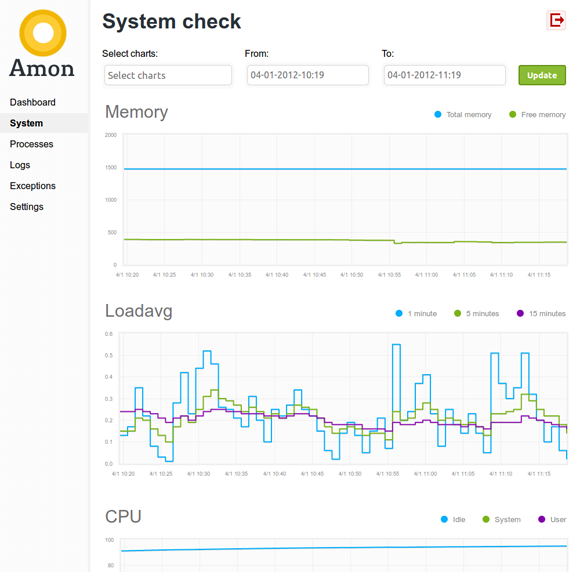 Collector daemon - Amon’s server and process monitoring is a thin wrapper on top of Unix tools to record metrics and store them in the MongoDB backend. Web interface - The web app provides a friendly user interface for viewing logs and visualizing data in charts. The Amon documentation site is a great place to get started with installation and usage.